Friends of Felines' Rescue Center is a non-profit, cage free, no-kill feline care facility. Earth Angels is a low cost spay/neuter clinic serving privately owned pets and many rescues and shelters in all communities. Our goal is to adopt our kittens and cats into permanent loving indoor homes and to reduce homelessness, abuse, and euthanasia due to animal overpopulation. We operate solely on the kindness of private donations, and receive no local or federal government funding. 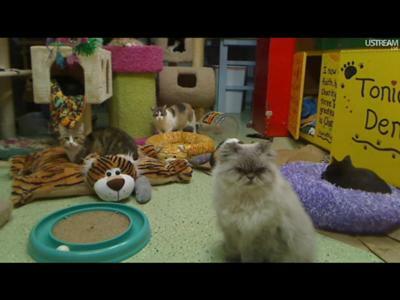 This shelter has 80-100 cats including the resident cats which are not for adoption because of their health conditions and demanding care they require. But many cats here are just waiting for their new loving home for the rest of their lives. These cats have undergone tough times outside, been left alone cold, hungry, and in bad conditions. But many good people are so caring as to bring these cats to FFRC (Friends of Felines' Rescue Center) to give them all the love they deserve in life. Plus, what is amazing about this shelter is the people behind the cam... the WEB CAMMERS, who are always there to give support (financially and emotionally not only to the cats but also to Jacci and all the volunteers at the center). They give food, cards, toys, beds, blankets and office supplies that are needed by the center. FFRC also won The Animal Rescue Site $300,000 Shelter+ Challenge with Petfinder.com. That's how this shelter has received love and support from people around the globe.